Recently, for my birthday Bernice Allen sent me some wonderful photographs of Dad visiting their house on Huffer Road in Hilton. Thank you Aunt Bernie! Above: This photo is labeled "Our house 182 Huffer Rd, Hilton NY. Stillman 'Cookie' Cook, Art Allen, June 14 '53". The group is sitting in front of the Allen House, enjoying watermelon and coffee. Dad (Stillman Cook) is in the center of the photograph, with Uncle Art Allen to the left, winking at the photographer. ( Either his wife Bernice Allen or sister Margaret Cook). Grandpa Arthur L Allen Sr. is probably the person standing at the far left. Aunt Bernie identified the kids as "neighbor kids". 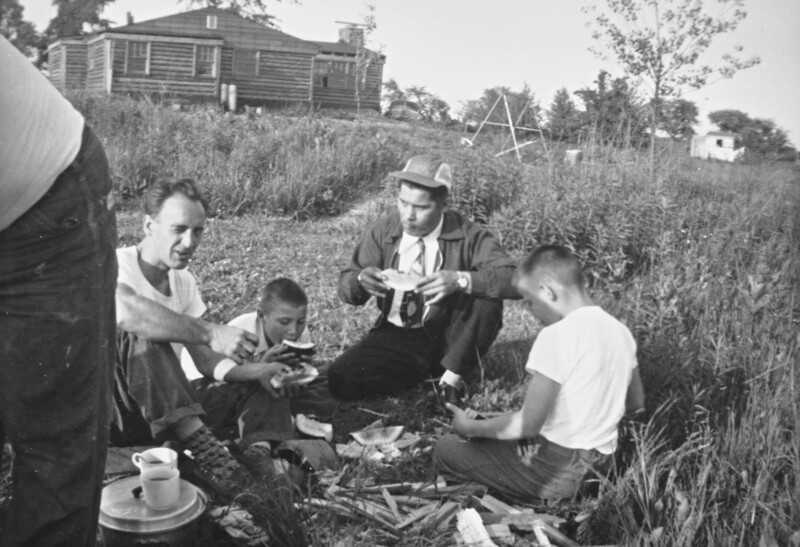 After enlarging the original photograph, I believe the boy eating the watermelon is either Gary or Larry, who would have been thirteen when the photo was taken. The boy on the right might be the other twin, but I am not certain. 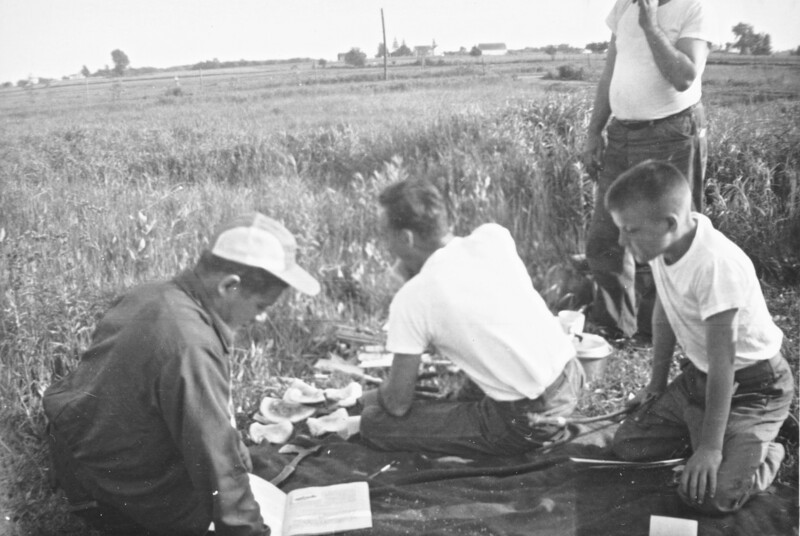 Above: This image is labeled "working on leach lines" and has a stamped date of February 7, 195-. (The last number is missing. This might have been taken in 1952 and processed in the winter of 1953.) 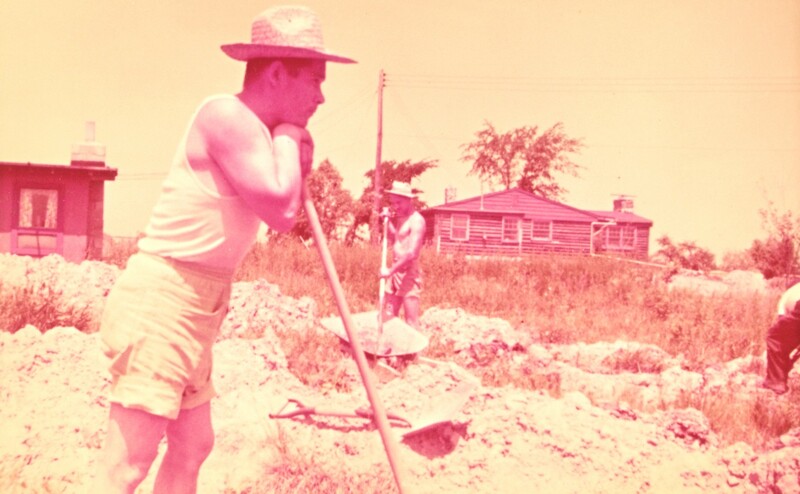 Dad is leaning on the shovel, Uncle Art is in the middle, and Grandpa is working to the right. The log house to the left is the one Uncle Art built for Grandpa and Grandma Allen. The one to the right is Art and Bernice Allen's house. Below: This photo was processed in December 1953 and may have been taken around Christmas. The label says" Living in the basement 3 yrs.". 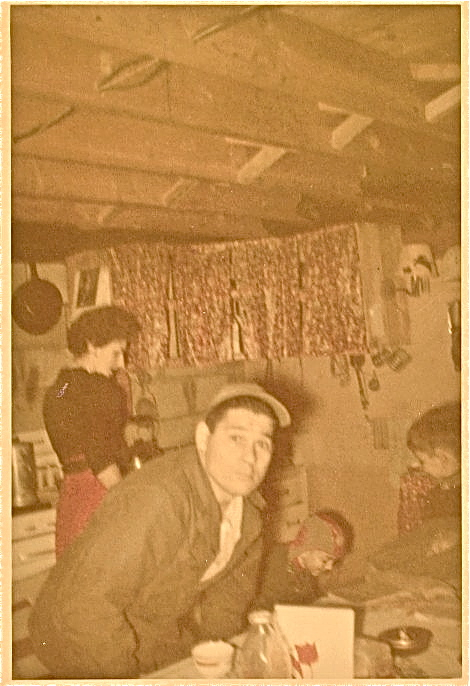 The family lived in the basement of the house for several years as Uncle Art built the main floor. You can see the stove behind Aunt Bernie (Bernice Streb Allen). Dad is sitting at the table. The kids behind him look like Danny in the hat, and perhaps Andy sitting on the table.